You are here: Home / News / Rwandan Refugees In Zambia Are Not Ritual Killers: Misplaced Xenophobic Attacks. Rwandan Refugees In Zambia Are Not Ritual Killers: Misplaced Xenophobic Attacks. Zambia has been and continues to be a haven of peace and a sanctuary for many Rwandan Refugees and nationals. Some of us were trained in Zambia and everything we are is as a result of the hospitality that was extended to us by the good people of Zambia since we arrived in Zambia years ago. We see Zambians as our brothers,sisters,mothers and fathers. And the feeling is mutual in many instances for they have facilitated our local integration and they seemed not to be bothered by our presence until recently. Former Refugees in Zambia and Refugees have being rendered destitute from xenophobic events that were inspired by nothing but “rumours“. ARE FORMER RWANDAN AND REFUGEES RITUAL KILLERS? Rumour has it that Rwandan Nationals in Lusaka have been killing innocent Zambian citizens in an attempt to enrich themselves. This rumour was driven by poor logic which could be as a result of sheer misunderstanding and lack of better judgment. Culturally, Sorcery is considered to be “taboo” in Rwanda and for the most part Rwandans tend to be religious and indulging in ritual killings could be possible but highly unlikely. First of all, Most of us have Christian First Names and our history can attest to one fact-we tend to believe in religion more than most Africans. Actually, Rwanda’s First Head of State was a Former Seminarian who trained to be a Priest but left to pursue politics. We might not be a Christian nation by denomination but our people are religious in most cases and they survived many tragedies by the grace of God. 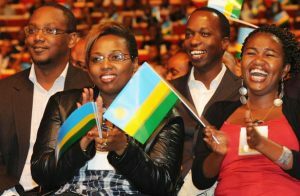 Rwandans, More than any other people understand the importance of God due to what befell Rwanda in the year 1994. If anything, The Church helped most of us to reach this far and one can tell from our recent conduct. Most Rwandan Refugees who lost their property and lives fled to the Roman Catholic Parish St. Ignatius to seek help and in hope that they were going to be protected. God is and has always been our refuge. Even in 1994 as events were intensifying in Rwanda, Most of our people sought shelter from Churches where they were massacred but still that did not stop them from believing that in one way or another, Some celestial force was in control. With the forestated being the case, The rumour that was spread was misplaced and must be condemned with the contempt it deserves. IS THE KIGALI GOVERNMENT INVOLVED? I am a staunch Refugee Activist but on this issue, The Rwandan High Commission in Lusaka has been more than helpful. The personnel in charge with intelligence at the Rwandan Commission was very instrumental in identifying areas which were prone to attacks and shared intelligence with Zambian security wings that led to the protection of lives of some Rwandan nationals(Refugees or otherwise) and their valuable goods and property, With that been said, It is rather unfair to place every blame on the Kigali regime even where it is clear that they have done nothing but help and mitigate the losses where possible. Incidentally, At this point-Rwandans needed to be safe from the xenophobic attacks and resorting to the Embassy of the country they fled from was a desperate move but to say the least, The ones who have being interviewed so far have nothing negative to say about their stay there-a rare trend but it is the truth. Now, more than ever-let us unite and find solutions to our core problem rather than shifting blame where it is not even necessary. THE ZAMBIAN ECONOMY AND TRIBALISM. It is not in dispute that from last year,things in Zambia have not been so great. Everyone was affected but Businessmen did not suffer much. Rwandan Traders operating mainly in Lusaka Compounds(High Density Areas) increased prices on their products which could not have being well received by the locals whose salaries remain intact. Coupled with the recent tribal attacks amongst Zambians and other internal politics-the animosity towards foreigners developed at a fast rate. Ordinary people in these compounds saw these traders as invaders who are stealing their jobs and were waiting for an excuse to take the law into their own hands and to rule out “jealousy” will be a naïve endeavour. The ritual killings just made their plan easy to implement for so far,there is no evidence linking Rwandan nationals to these criminal activities other than propaganda. The small cars Rwandan Refugees have started purchasing could also have been a catalyst but everything is premised on the struggling Zambian economy. It could be seen by the kind of goods these criminal elements were targetting-meallie meal,cooking oil-essential commodities needed for daily survival. Otherwise, Zambians are a good people who could just be acting out of frustration-which is normal in any society albeit undesirable. Zambia is a peaceful nation. We ran away from our respective countries as a result of unbearable circumstances similar to these recent atrocities. All we want is to see another day-to pursue happiness. We want to survive and killing innocent Zambians is insidious to our stay in this lovely country. We thank the Zambian Government (President Lungu and Father Chilinda in particular) for giving us hope that we will see a better day. We thank everyone who helped our people and pray that things do get better for most affected Rwandan Refugees and former ones have been traumatised. Let us stop sinking so low by believing in unfounded rumours and let the security wings do their job. We are an ‘ ADVOCACY AGENCY’ that specialises in DISPUTE SETTLEMENT in liaison with relevant ‘LEGAL ADVOCATES’. Can visit our official “fanpage” over at Facebook; Lionel Nishimwe & Ngandu Consultancy.